You can add custom fields from Jira into your plan in Portfolio for Jira, so that you can view and edit these fields directly in your plan. Note that other standard custom field types are read-only in Portfolio for Jira. Click more ( ) next to the plan name > Configure > Custom fields. If your plan doesn't have any custom fields yet, click Add custom field. In the Custom fields page, click + Add custom field. Select the custom field you want to add, and click Add field. Select the custom field you want to remove > click more( ) > Remove from plan. To confirm the removal of the field, click Remove field. 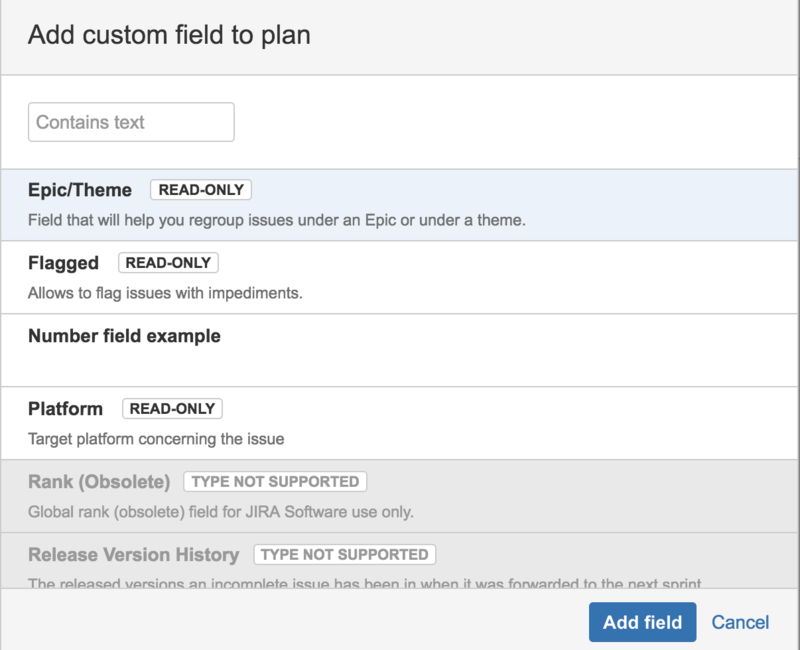 You can further configure your custom fields in Jira by clicking Manage custom fields.